When you first learn about the concept of positioning and perceptual maps in marketing, students are often told about the standard two-axis perceptual map. While this is a good beginning to help understand the concept and while it can be very effective tool itself, in some regards it is a too simplistic view of the perceptions of consumers and how they make purchase decisions. In reality, a perceptual map should reflect how consumers actually differentiate between competing brands in the marketplace. For this task, consumers usually rely on what is called determinate attributes. Determinate attributes are the particular product features or benefits that consumers use to distinguish between competing brands. These attributes then allow the consumer to choose the most appropriate brand or product that is the most suitable solution to their problem/need. 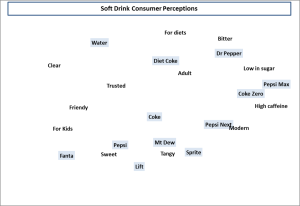 For some low involvement products (such as soft drinks, a newspaper, or a candy bar) consumers may rely on one or two determinate attributes to make their choice – which would need that the standard two-axis perceptual map is quite suitable for use. But for more highly involved purchase decisions, it is extremely unlikely that consumers will rely on just one or two attributes in their decision process. Indeed, the more complex or highly involved the purchase decision becomes, the greater the number of determinate attributes that a consumer is likely to rely upon in their pre-purchase evaluation phase. This is where multidimensional scaling (MDS) techniques come in. This is a statistical process much like correspondence analysis in the SPSS package where related sets of relationships are measured and plotted onto a positioning map. Therefore, this enables a marketer to map multiple dimensions at the same time onto the same map. By dimensions in marketing terms, we are referring to the brands and/or products AND the product attributes (that is, benefits and features). This then becomes a valuable tool that provides the marketer with an overall assessment of how consumers look at a market. In particular, the marketer can better understand how consumers group attributes together, their view of competitor sets, and how they are actually distinguishing between the brands and offerings in the marketplace. And if you are planning a career in marketing, or are already a marketing practitioner, you will probably need to review these types of positioning maps as they are often generated by a professional market research firm when undertaking image or brand market research. On this website there is a free Excel spreadsheet template to download and use. You can click here to download the free multi perceptual map template. Note: You will need to enable the macros when the spreadsheet opens. This template that allows you to quickly and easily map up to 12 brands and up to 12 product attributes at the same time. Normally this would require the use of a statistical package, such as SPSS, but of course, not everybody has access to that piece of software. 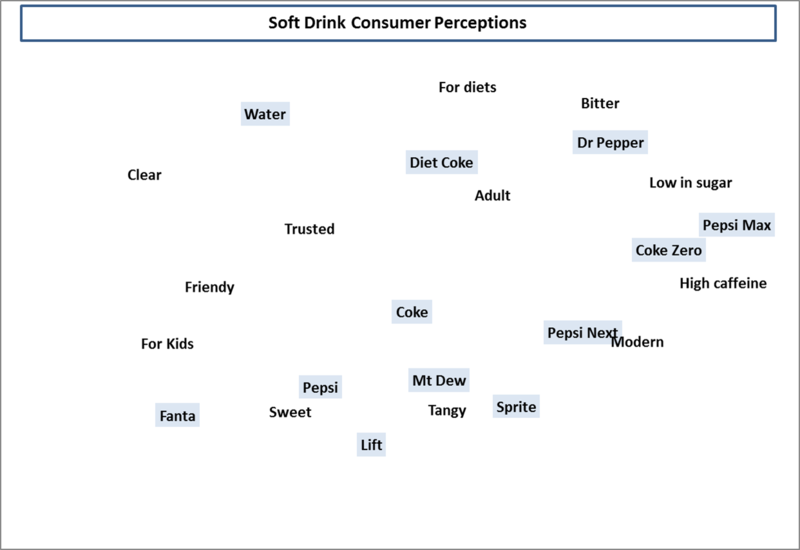 Therefore, this template has been designed to enable students and practitioners of marketing to be able to easily use and understand this important approach to mapping consumer perceptions of market positions. Also on this site you will find helpful articles on how to interpret and use a multidimensional perceptual map, as well as discussions of other types of perceptual maps which also may be appropriate for your marketing needs.